During Fr. Sean Heslin’s tenure as pastor of St. Paul Church, he spearheaded planning for the establishment of a low-income senior citizen home. It is located diagonally across the street from the Basilica of St. Paul on 401 North Ridgewood Avenue in Daytona Beach, on property that was formerly the site of St. Paul Convent. Under the stewardship of Father Ruse, Casa San Pablo was completed and dedicated during the weekend of March 14, 1987. Casa San Pablo, although sponsored by the Basilica of St. Paul, is a non-denominational senior citizen home whose doors are open to all eligible persons regardless of race, color, or creed. 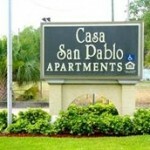 Tenants must be age 62 or older (or be mobility impaired). The US Department of Housing and Urban Development subsidizes the rent payments of the low-income residents of the facility. The facility features an outdoor courtyard for the leisure of the residents. 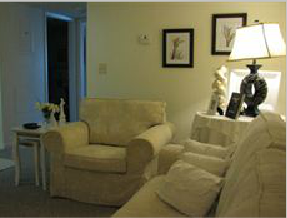 A community room is also provided for residents to meet and socialize. One bedroom and efficiency apartments are available. Renovations are periodically made to the apartments, and other amenities are added and improved as well. A board of directors is appointed by the Pastor of the Basilica of St. Paul. The board meets a minimum of two times per year and serves as a resource for the residents of Casa San Pablo and oversees the budget and management of the facility. It is also responsible for contracting with a management firm, and currently SPM Inc. serves Casa San Pablo. 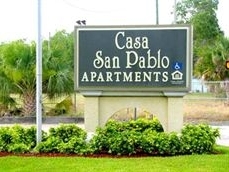 For more information about Casa San Pablo, visit their web page on Senior Outlook to see photos, floor plans, and the options for seniors.. You can also call 386-253-2828, or you can send them a Fax at 386-253-0842.